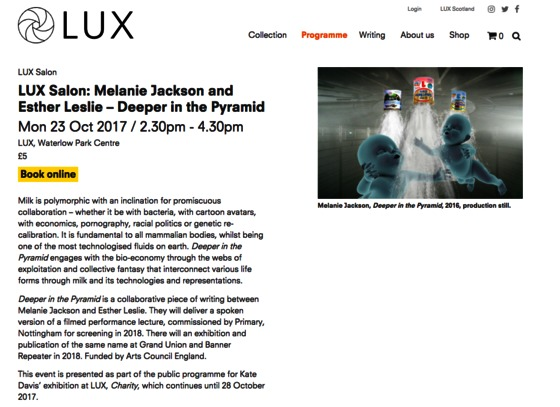 Jackson, Melanie and Leslie, Esther, 2017, Conference or Workshop, LUX Salon: Deeper in the Pyramid at LUX Salon, London, UK, 23 Oct 2017. Deeper in the Pyramid is a collaborative piece of writing between Melanie Jackson and Esther Leslie. They will deliver a spoken version of a filmed performance lecture, commissioned by Primary, Nottingham for screening in 2018. There will an exhibition and publication of the same name at Grand Union and Banner Repeater in 2018. Funded by Arts Council England.